COLD SPRAY AEROSOL 4OZ CAN TOPICAL COOLANT USED TO COOL SKIN REDUCING SWELLING AND PAIN 23017 Topical coolant that reduces swelling & pain. Can be used to numb area to remove wood or metal splinters. 4oz. Can. …with Carlisle deck scrubs, vehicle brushes, upright brooms, and floor sweeps. * Its reinforced, threaded metal tip makes it compatible for use with heavy/coarse floor sweeps. * Powder-coated, metal handle is soak-proof to prevent cracking and splintering. * Features a plastic hanging cap. * Made in USA. TWEEZERS WITH ATTACHED MAGNIFYING GLASS Metal tweezers with attached magnifying glass. Helps to spot & remove small splinters. 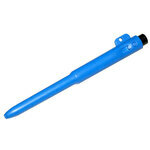 MARKER DRY ERASE METAL DETECTABLE DEPEN BLUE BODY, BLUE INK 10/BX BULLET TIP * Produced from a specially formulated polypropylene mix, containing a non-toxic detectable additive* Detectable and rejectable by metal detection systems* Shatterproof, and will not splinter into small segments.